Waiting on the solar sideline. Will it cost LESS to wait? Home / Blog / Waiting to BUY solar electric: The pros & cons. Waiting to BUY solar electric: The pros & cons. One of the more frequent questions I hear prospective buyers ask is whether or not they should wait two, three, or five more years before investing into a Solar PV system for their home or business. 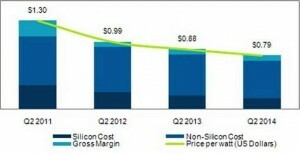 The most common hesitation I hear is the speculation that solar technology efficiencies and costs will continue to come down, as most of us don’t want to pay a premium price for technology, only to learn that a year later prices have fallen less than what we originally paid. My answer to this is that each buyer’s situation is highly subjective. Example #1: If you own a home and your utility bill is about $110 a month; you’re not into saving the planet, and you don’t want to finance money that could be used elsewhere in a better investment, (where it can earn a higher rate of return) then I say do not invest in solar PV. If, however, you’re motivated to be green as a matter of principle and personal values, and you locate a favorable lease or power purchase agreement with excellent price, terms and conditions, then by all means, go for it! The litmus test is to stack your average monthly utility payment against the payback and return on investment of a solar PV system. Generally, I tell anyone who has an average $110 utility bill or less, to pass on solar PV until prices drop on par with the price of paying for grid delivered electricity. This is known as “Grid Parity”. Currently, small utility bills win out over the cost of investing in solar PV. Example #2: But what if you’re a home or business owner and your utility bills are slamming you every month? What is the true cost of waiting for solar technology to improve and prices to come down? Remember; with each year that goes by, you’ve passed on emancipating yourself from your utility company for the next 25 years. Again, the return on investment, payback, cash flow, and the internal rate of return are something that Sun Source, along with your attorney, and tax accountant can help you in determining the best time to purchase. For instance, what if your payback for a solar investment is five or seven years? If you’re able to get into a solar lease or power purchase agreement, or a privately funded finance scheme; what would it be worth to swap out your monthly utility payment and apply that monthly budget to your new solar purchase? What if your monthly solar PV payment were the same, or even LOWER than what you pay you local utility company? As far as solar technology and price; with solar power there are constant small improvements over time, so it’s natural to expect solar pv systems to perform better in five years, and yet, even better in 10 years. So you could wait for these improvements to come along, but what opportunity in the form of utility savings have you lost in waiting? You need to take a rational look at the cost of continuing to pay your utility bill without solar PV, against what you could have paid off on a solar PV system in five years or seven years, plus interest. Further, solar technology will continue to make incremental improvements all of the time. Change is good, just like any type of technology we consumers’ purchase; a cheaper, faster, more modern version will be coming out every month. I admit that the years between 2008 and 2011 wholesale solar module prices have seen significant price index drops, and if I had the information predicting those price drops, I still may have been writing the same article, as each buyer’s scenario is situation specific. This is really much more about what you are currently paying for your public utility compared to what you will or will not save by investing in solar PV. Hence, you need an accurate analysis to make an informed decision. It’s more about the cost of lost opportunity. So yes, if you wait, you’ll probably get a better system for a better price. However, the price drop will not be gargantuan, as the chart and the prognosticators exemplify for 2012 to 2014. Waiting means you will not enjoy the immediate benefits of the solar electricity and the savings on your electric bill while you are sitting on the sidelines. How much will you spend on your electric bill month-after-month and year-after-year while waiting for a better solar electricity system? You decide.